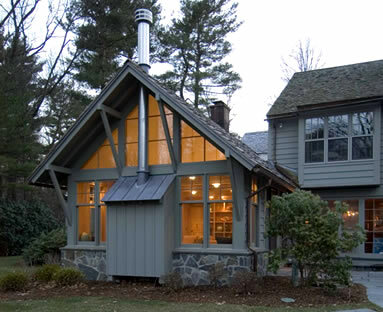 This one room addition replaced a 1970’s sunroom, off the back of a Royal Barry Wills house in a private suburban setting. At the owners’ request the room was kept as open as possible to the wooded landscape while also serving as comfortable room in which to watch television or enjoy a fire. The exterior materials are borrowed from the main house but the form of the addition is adapted from structures of the north woods with its steeply sloped roof and deep overhangs. The interior is finished in red birch with a muted green stone tile floor and counters, in keeping with the natural landscape outside. The inside wall is devoted to a geometric pattern of cubbies to contain the owners’ collection of objects acquired on their world travels.